“The key to success with a vacation rental is having a good management group handle it,” Fox agrees. “When we bought it in 2002 we were with another management company and it wasn’t doing anything.” Fox later signed up with San Diego Sunset Vacation Rentals and saw his rental income grow. Holland agrees that it is important to have a qualified management company, unless you want to make your vacation rental your full time job. “When I was ready to make my beach area home a vacation rental, I looked for a management company that would market it the way I thought it deserved,” Holland explains. “When I couldn’t find one, I decided to market it myself. It quickly became a full-time job, then a business.” San Diego Sunset now manages nearly 70 properties and offers full real estate services. The downside is that you can’t live in it until after age 59 ½ , but in the meantime, vacation rental guests can be helping you buy your dream home. Allow a broker experienced in both real estate sales and vacation rental management help you decide the best property for you. The first step is to transfer your regular or Roth IRA into a self-directed IRA account. It will be overseen by a custodian such as Fiserv or PENSCO Trust Co. With the IRA funds, you can then make a down payment on your dream retirement home. You need to be able to pay all expenses for the retirement home out of the income. With the exception of legal fees, you are not allowed to use non-IRA funds to pay expenses of the home. You can use other IRA funds to pay expenses that come up. You, your children, your parents, spouse, grand-children and their spouses cannot stay in the home, with or without paying rent. Most other relatives can rent it, though. You are not allowed to manage the property yourself, so a property management company will be needed. SAN DIEGO—In an effort to give the best possible experience to guests, while keeping the costs down for property owners, San Diego Sunset Vacation Rentals has contracted with Specialty Textile Services of Chula Vista to provide linens for its 50-plus units, President Will Holland announced. SAN DIEGO—San Diego native and Occidental College graduate Amanda Caperino has been named customer service manager of San Diego Sunset Vacation Rentals, announced President Will Holland. Caperino started at Cold Stone at the age of 16 and worked her way up to manager, where she dealt with customer relations and handled every aspect of running a business, from bookkeeping and employee management, to ensuring customer satisfaction. “We are very excited that Caperino chose San Diego Sunset and will be a part of our continued growth in the vacation rental market,” Holland said. 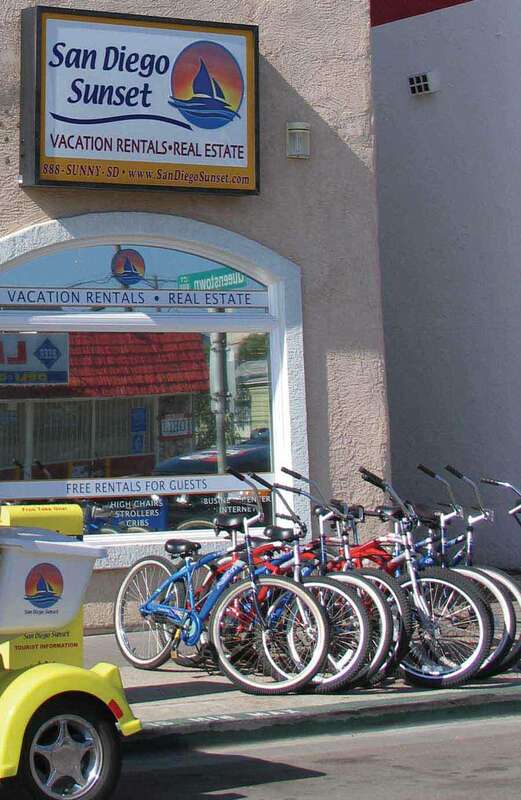 SAN DIEGO—With a goal of economically meeting the needs of vacation rental guests, San Diego Vacation Rental Company broke with tradition and became the first local company to offer free access to bicycles, boogey boards, horseshoe sets and nursery needs. The company, which manages more than 50 Mission Beach and Pacific Beach area vacation rental units, allows families to reserve bicycles for a ride along the beach, boogey boards for some fun in the surf and horseshoe sets for some beach competition. “We have a lot of families with small children who need cribs, high chairs, strollers and booster seats, but don’t want to haul all those things from home,” Holland explained. “We have them here for our guests to use for free.” San Diego Sunset doesn’t just keep one or two of each recreational or nursery item on hand, but plenty to meet the needs of its guests, according to Holland. “All a guest has to do is reserve the nursery items they need when they make their rental reservations and those nursery items will be waiting for them when they check in.” The bicycles and boogey boards can be reserved up to a day in advance, he said. SAN DIEGO—Free fitness center access has been added to the list of guest services provided by San Diego Sunset Vacation Rentals, President Will Holland announced. “When people are traveling, they often want to continue their exercise regimen, or even start a new one, and free daily access to a fitness center is something they really appreciate,” Holland explained. Guests staying at any of San Diego Sunset’s more than 50 Mission Beach/Pacific Beach area vacation rentals can use the Powerhouse Gym, located at 4150 Mission Blvd, in the Promenade Shopping Center. The gym is centrally located and within walking distance of the areas vacation rentals, Holland noted. The location also provides plenty of free parking for those who prefer to drive to the gym, he said. The 14,000 square-foot facility has a complete cardio center, with entertainment. For the weight lifter, there are traditional weight machines, plus a large free weight room. Free group classes, including yoga, Pilates and aerobics are also included in what is available to San Diego Sunset guests, Holland said. SAN DIEGO—A leader in innovation in the local vacation rental industry, San Diego Sunset Vacation Rentals has gone green, relying on clean air vehicles for the bulk of its business, President Will Holland announced today. San Diego Sunset has turned to zero-emission electric vehicles and bicycles to take care of the day-today business of the vacation rental company, he said. A bright yellow electric GEM vehicle with the San Diego Sunset Vacation Rentals logos, an electric Segway transporter, and a fleet of bicycles take Holland and his employees up and down the 4-mile stretch of Mission Boulevard, where the company’s 50+ vacation rentals are located. “It made a lot of sense for a lot of reasons,” Holland said. “We want to keep the ocean air clean and reduce the use of polluting combustible engines as much as possible.” He said that the frequent but short trips required for upkeep of the vacation rentals burned a lot of gas and gave off plenty of pollution. “We probably reduced our fuel usage by about 85 percent,” he said. The four-seater GEM car will go at speeds up to 25 miles per hour and will travel up to 30 miles on a single charge from a standard 110-volt outlet. “We estimate the cost for electricity is about 15 percent of what we would be paying for gas at today’s prices,” Holland said. “But the reduction in gas emissions is the real pay-off.” The GEM car is limited to streets with a posted speed limit of 35 miles per hour, so it is perfect for around Mission Beach and Pacific Beach, but it can’t go on freeways or expressways. SAN DIEGO—Have you ever been on vacation and had some immediate business to tend to, only to find out that your hotel charges an exorbitant price to use its business center? It happened to San Diego Sunset Vacation Rentals President Will Holland, which is why he has a business center that is free for his guests. A vacation rental can be the most economical way to take a vacation, but watch out for those extra charges, he warns, and make sure you will be provided what you need, like access to computers, the internet, faxing and printing capabilities. Guests at the 50-plus Mission Beach and Pacific Beach area vacation rentals Holland manages, also get free access to a fitness center. “We want to be the company that provides vacationers more than a rental unit, we want to provide a vacation experience,” Holland said. SAN DIEGO—In an effort to provide a resource for Mission Beach and Pacific Beach vacationers, and promote the Mission Beach and Pacific Beach areas as a vacation destination, San Diego Sunset Vacation Rentals has begun publication of Mission Beach Magazine, announced San Diego Sunset President Will Holland. “We wanted to accomplish two goals – draw vacationers to the Mission Beach and Pacific Beach areas, and to offer them a guide of things to do while they are here,” said Holland. The third issue recently hit the stands, with 10,000 copies being distributed in a variety of ways. Distribution stands are placed throughout the area and partner business also distribute the magazine, according to Holland. “Each guest of San Diego Sunset Vacation Rentals gets a copy when they check in,” he added. The Spring/Summer 06 issue of Mission Beach Magazine includes articles about area golf courses, Balboa Park, San Diego Zoo and Mission Trails Regional Park. Articles also give tourists information on charter fishing trips and a San Diego tour company. The magazine also pictures and describes the 50-plus vacation rentals managed by San Diego Sunset Vacation Rentals. “The same information is available on San Diego Sunset Vacation Rentals web site, www.SanDiegoSunset.com, but a lot of people like to page through the magazine and read about the rentals, rather than surf the net,” Holland said. Holland encourages anyone who would like a copy of the magazine, or is interested in advertising, to contact him at info@sandiegosunset.com. “We have had a lot of very positive feedback on the magazine from both vacationers and area businesses,” he said. SAN DIEGO—”Have a Blast” in San Diego with the discount card recently introduced by San Diego Sunset Vacation Rentals and Mission Beach Magazine. The new discount program provides area visitors with discounts and free services at 17 Mission Beach and Pacific Beach area businesses, San Diego Sunset President Will Holland announced this week. Each guest checking into any of the 50-plus San Diego Sunset Vacation Rentals receives a “Have A Blast Pass” along with a list of participating businesses and what they offer. A listing of “Have A Blast” partners and the discounts or free services they offer is also published in Mission Beach Magazine, according to Holland. The pass offers discounts on surfing lessons, pizza, recreational rentals, beachwear and sandals, jewelry and a long list of other goods or services. For example, Segway of Pacific Beach will honor the “Have A Blast Pass” with a 10 percent discount off any two-hour Segway rental. “Where You Want to Be Tours,” which was recently featured in Mission Beach Magazine, offers $3 off walking or bike tours or $100 off a scavenger hunt. If what you are really looking for is a beauty treatment, Mission Hair & Nails offers a 10 percent discount off a manicure and pedicure, then cross the street for a 10 percent discount off a pair of sandals. You won’t be done until you head to Mission Beach Cleaners and Tanning for a free tanning session with any fluff and fold service. Top the day off with a jewelry purchase at 10 percent off at nearby Chris’ Jewelry. “The ‘Have A Blast Pass’ also allows San Diego Sunset guests unlimited free access to the Powerhouse Gym in the Promenade Shopping Center, and free use of San Diego Sunset’s business center, free Wi-Fi, as well as free bike, boogey board and horseshoe rentals,” Holland explained. For more information about becoming a “Have A Blast Pass” partner, Holland encourages businesses to contact him at info@sandiegosunset.com. There is no cost to participate in the program, just a commitment to offer great service and a discount or free service to San Diego Sunset guests, he said.